We’d love your help. 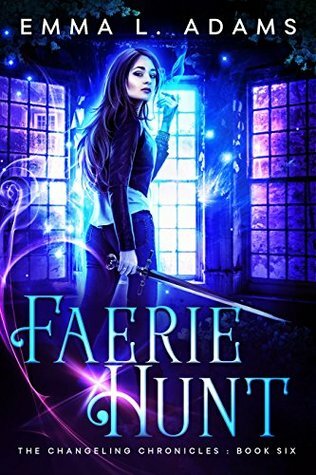 Let us know what’s wrong with this preview of Faerie Hunt by Emma L. Adams. I'm Ivy Lane, and lately, my life has been suspiciously free of faerie-related drama. But there's a storm coming. Now, the lords of Faerie know I have their magic. What they don't know is that I killed a powerful faerie, and might just have doomed both our worlds in the process. With hellhounds camping out in my garden and a dark uprising amongst the half-faeries, somethin I'm Ivy Lane, and lately, my life has been suspiciously free of faerie-related drama. But there's a storm coming. Now, the lords of Faerie know I have their magic. What they don't know is that I killed a powerful faerie, and might just have doomed both our worlds in the process. With hellhounds camping out in my garden and a dark uprising amongst the half-faeries, something bad is on the move in Faerie. To ask other readers questions about Faerie Hunt, please sign up. Does anyone know how many books there will be in the series? This has been a solid urban fantasy series so far and this book was no different. Ivy and Vance are just back from their vacation when they land right into another issue that requires their attention. The start of this one felt a bit slow, but once they start finding clues and coming closer to finding out what's going the pace seemed to pick up and I got more into the story. The further you get the better the book gets. The endin I received a free copy from the author and voluntarily reviewed it. This has been a solid urban fantasy series so far and this book was no different. Ivy and Vance are just back from their vacation when they land right into another issue that requires their attention. The start of this one felt a bit slow, but once they start finding clues and coming closer to finding out what's going the pace seemed to pick up and I got more into the story. The further you get the better the book gets. The ending was really good and makes me curious to read the seventh and final book in this series to see how everything will be resolved. It's again filled with action, battles, nasty fairies and the faerie realms. Ivy and Vance are a good couple and I like how they fight together to solve whatever is threatening their realm now. Really it's hard to say a lot about this book that I haven't said already. It's an enjoyable series that has kept my attention so far and each book has it's own plot line, but there are also some connections or things that build-up from the previous books. In this book that effect was the strongest as there are multiple references to things that happened before and how those events impact what happens now. And this book leads up to what might be their biggest problem so far and when the book ends we're halfway through basically. Ivy knows what's going on and things are pretty bad and the last book will tell how everything gets resolved. Compared to the other books this ending would almost be called a cliffhanger as it doesn't have as clear an ending as the previous books. But I thought it really worked here and the way things end just makes me curious for the last book and I hope I can read that one soon. I felt like this book shed some light on previous addressed things and we come closer to understanding exactly what Ivy and her magic is capable of and what started the invasion. Each book gives us a few hints but here it starts to all tie together. Even the previous big bad guys of each book seem connected now. And the ending hints that we're going to see a part of Faerie and the faeries we haven't seen so far in the next book, so that should be interesting. A big cliffhanger but so exciting. Everything is coming full circle with the threat of another invasion and everything is going crazy. This world would be so much more peaceful without the Sidhe. I have to see what the Summer Court has to say about all this. This was an AMAZING next installment of the Changeling Chronicles - and I absolutely love the author for not making us wait too long in between books, without sacrificing quality. I was on the edge of my seat throughout most of the book, and yet surprisingly, I didn't think that it moved too quickly - every scene was adequately explored. I do get frustrated with the heroine sometimes, but the author has done such a good job of developing her character's history that it still makes sense. I eage This was an AMAZING next installment of the Changeling Chronicles - and I absolutely love the author for not making us wait too long in between books, without sacrificing quality. I was on the edge of my seat throughout most of the book, and yet surprisingly, I didn't think that it moved too quickly - every scene was adequately explored. I do get frustrated with the heroine sometimes, but the author has done such a good job of developing her character's history that it still makes sense. I eagerly await Book 7! This is a magic-packed, action-filled adventure with a heroine who's ready to take on any faerie who dares to stand against her. Ivy returns from vacation to another mysterious death, and she has no doubt that the fae are involved. Again. Of course, nothing is as simple as it seems and before she knows it, the fate of all realms lies in her hands. I've been following this series from the very beginning, and even though this is book six, it's still as exciting as the very first one. Ivy's grown int This is a magic-packed, action-filled adventure with a heroine who's ready to take on any faerie who dares to stand against her. I've been following this series from the very beginning, and even though this is book six, it's still as exciting as the very first one. Ivy's grown into her powers and has matured in the areas of decision making and judgement. She fights for what's right and refuses to give in. In other words, she's grown into a character to root for to the very end. Although Ivy is up against the Fae again and again, the plot remains fresh. The 'evil' characters all have their own, complex stories and have also grown. The interplay between the different realms has thickened and there are always new corners to discover. As always, the author brings the worlds to life and it's no problem to sink right in. There is romance, and it's a steadfast one, which, by now, never borders into doubt. But then, Ivy barely has time for such things. The action increases from one scene to the next, raising the tension right along with it. There are unexpected twists and turns which make it impossible to see where things will take Ivy next. There are plenty of fight scenes, monsters around every corner and magic flowing without end. This is the sixth book of seven in the series. So, if you've read the series so far you'll continue to the last book. I thought the book had a lot of action and I like the characters in the series very much, however the book ended on a cliffhanger. I did not feel that this book had any type of stand alone plot with an overall story arc. This book felt like it was setting the stage for the last book. In my opinion, this is more of the first half of the last book than it is a complete book. I did This is the sixth book of seven in the series. So, if you've read the series so far you'll continue to the last book. I thought the book had a lot of action and I like the characters in the series very much, however the book ended on a cliffhanger. I did not feel that this book had any type of stand alone plot with an overall story arc. This book felt like it was setting the stage for the last book. In my opinion, this is more of the first half of the last book than it is a complete book. Faerie Hunt is the sixth book in the Changeling Chronicles written by Emma L. Adams. Ivy Lane finally got a break from all of the Faerie drama for a short period of time. However, that was the calm before the storm. The threat from the Grey Vale is always present and getting more and more dangerous every day. It is up to Ivy to stop another invasion from happening. Overall, this was another great addition to the series. The plot is fast paced with a ton of action and suspense. Epic ending to this book! I don't remember why I waited so long to read this book. Ivy had a much deserved vacation and came home to disaster after disaster. It ends on a major cliffhanger. I was on the edge of my seat and bouncing excitedly while reading this book. I think this was the only book in the series that did not have an ending but only a lead in to the next book. Other than that this was another action packed book. Fantastic continuation of the series but why does everyone come back from the dead? Still a very well crafted story about faeries, magic, and the impending apocalypse. I really liked these books. I do believe they should be marked as New Adult. It would be nice that Ivy could catch a breath before the next nasty little thing happens though. This just keeps getting better with each book. Now I'm on to book 7. I just hope people who read my reviews are also reading these books. Read on! I really enjoyed this book. To me it had the right Combination of action, indomitable will to survive and to save friends and loved ones. The way the heroine is learning how to deal with her new abilities and determined to still keep her humanity. Have enjoyed all six books in this series, glad I decided to give it a try. Looking forward to book 7. The whole series is a great read. Looking forward to the next book. Be sure to read this series folks! It was a great series but ended too abruptly. What happened to Vance??? What happened to her magic and the girl? I enjoy this series but this one seemed to get nowhere - ended with no resolution. I like Ivy Lane and all of the characters but I like to see one problem solved and another set up for the next book. I felt like I was left with too many questions in this one. I loved this book and I was kept guessing the whole time! I never could've predicted how it had ended and I'm so excited to see how it turns out!! I love this series. Great story lines. I need more books. Love it, can't wait for the next book to come out. It's hot steamy bad magic chick action, a lot of crazy in all. Great heroine and plots, hopefully in book 7 Ivy gets her magic and more back.